And with the grace of Baba, I wish to produce the articles written in this book to the devotees. The Title of the Section is Devotees Experiences of Shri Sai Baba, Shirdi, When Baba was Embodied. On one evening Shri Kakasaheb Dixit was returning from his Office. A strong, young and able bodied beggar and begged him. On seeing his face he was convinced and gave some coins in this hands. After the receipt of the money, he went away laughing without asking anything from anybody. Dixit seen him off till he disappeared. Dixit started to Shirdi on the day. When he met Baba in Shirdi, he enquired Him about the matter. Baba replied “Yes” I verily came in that disguise. Dixit was much pleased on hearing this. Stupendous Delectation and Deliverance be there! Shri Vasudeo Sadashiv Joshi of Sitharam Co., accompanied by Shri Chidambara Rao Keshv Gadge Patil went to Shirdi to have Baba's darshan. They stayed in Sathe's wada. Arati was being done to Baba's photo in Sathe's wada and Shri Vasudeo Sadashiv Josh! also attended the Arati. For him Baba has given darshan as Narasimhamurthy in the Photo. He got this kind of darshan during the three consecutive days. On one day, both of them went to Baba for darshan and the latter gave them prasadam. They felt that the pra-sadam was insufficient to distribute it to their men in their native place. Then Baba gave Re. 0-8-0 to them and directed them to buy Prasadam in any shop in Shirdi and take it with them and added that any Prasad purchased in Shirdi is His Prasad. On another occasion Baba gave them burfi Prasad. As it is very tasty, they wanted more and they went to the shop to buy it. Baba called them back and told that three basckets of Prasad was there, take two maunds from them. They went away to their place with Baba's Udi and Prasad. After some days, Shri Joshi sent his friend with Rs, 10/-as dakshina to Baba and requested him to take Baba's photo and return with Baba's Udi and Prasad. His friend went to Shirdi offered Rs. 10/- as dakshina to Baba and kept silent as he had no courage to take the photo of Baba. Baba, knowing this, He Himself asked Him to take His photo as requested by Joshi. Then he took one Baba's photo in sitting posture and one in standing posture, Baba has ordered him that the photos should not be sold in excess rate, they should sell only at reasonable rate and gave him permission tp go with His Udi and Prasad. That is how Baba has fulfilled the desires of His devotees. Surrender Shri Sai Completely ! Stupendous Delectation and Deliverance be there I ! When Shri Raghuvir Bhaskar Purandare had first started to Shirdi, he requested his mother to accompany him. On the previous day of his departure, his daugh-ter has suffered from severe fever. Even then, he did not step his visit and came to Shirdi with his mother leaving his mother leaving his wife and disceased daughter at home. On the third day of his arrival at Shirdi, Baba appeared in his wife's dream in his house and applied Udi on the forehead of his diseased daughter. From that time, his daughter began to improve and became alright when he reached home. He knew this Leela of Baba and ever felt grateful to Baba. Surrender Shri Sai Completely ! Stupendous Delectation and Delivereance be there ! ! Shri Vamaii Chintaman Munge, Vakil of Pimpal-gaom Baswanth, Nasik District when plague was prevailing in Pimpalgaom Baswanth, he shifted his residence to his house in his estate (i.e.) in his lands. One day night, thieves came there, made a whole and entered the house particularly in the place where Munge, was sleeping in a cot. Baba's photo was also hanging on the wall. The thief has lifted a small box under the cot and passed on to another thief standing outside the house. The small box contained a cash of Rs. 2CO/- (Rs. Two hundred only) and some promissory note worth Rs. 4, OOO/- (Rs. four thousand only) The thief again came and was about to lift a big tiunk in front of the cot which contained jewels worth about Rs. 10, OOO/- (Rs. ten thousand only). In the meanwhile Baba appeared in his dream and woke him up stating that theives have lifted his belongings. His sister in-law also wake and they cried out loudly as "Thieves", "Thieves”. Then all the servants and watchmen woke up and chased the thieves. However, the thieves have escapped leavirg the big trunk. The next day the small trunk was found in a field nearby. The thieves have taken away the cash and left the promisory notes-During that day night, he got a vision in his dream that Shri Sai Baba, Shri Abdul Baba and another Fakir with strong personality appeared before him. Aftej some days, he visited Shirdi and took da.rsh.an of the same three persons of whom he has seen in his dream and he himself ascertained that the third Fakir was the Master of Shri Abdul Baba. After some days, one Shri Datta Brahmachari of Kopergaom has visited his house for meals and he told him that the lost properties will be available. Accordingly, Rs. 60/- and the other properties were seized aiid haridedover to him by police. The police have stated that the cmouut was seized and handed over by them from a Marwadi along with some other theft articles. This clearly shows that Sai Baba was not only, safeguarding the interest of His devotees but also their belongings. Surrender Shri Sai Completely I Stupendous Delectation and Deliverance be There !! Once it so happened in Shirdi that a bull dedicated to God Shivji roamed about in the village gardens and fields and destroyed the plants, standing crops etc. So people met together and decided to send away the bull to Panjra Pole (an asylum for old beasts) at Yeola and collected some fund for the purpose. They entrusted this work to Bhikoo Marwari of Shirdi in all good faith but the said Bhikoo Marwari proved treacherous. He did go Yeola as directed, but instead of taking the bull to that asylum, he sold it to a butcher for a sum of Rs. 14/- returned to Shirdi and calmly reported that he had taken the bull to Panjra pole and left it there. Baba knew how the bull was dealth with. So he appeared in one Shri Bayaji's dream and said "you have been enjoying sound sleep of rest. Have not you placed me in a butcher's hand?" Bayaji reported this to the village people, who, growing susppicious of the bonafides of the Marwari, deputed Bayaji to Yeola for investigation. Bayaji went to Yeola Panjra Pole, took complete search of it. Not finding the bull there, he went to the butcher's lane and looked about here and there. Fortuitously at this very time, the bull had raised up its head above a buscher's compound wall. Shri Bayaji saw this, he atonce recognised it (the bull), so he approached the butcher and requested him to return the bull, but he would not part with it as he has purchased it for Rs. 14/- and then took it (the bull from the butcher to the old beasts asylum and kept it there. On his return to Shirdi he acquainted the people with what Bhikoo had done and so to set a lesson to such sinful, faithless people as Bhikoo, Baba inspired them to prosecute him. Bhikoo had to undergo in jail for two months for his treacherous act. From this, it is seen that Baba had his Benign protective eyes not only on human beings but also on all creatures. In 1914, Sakarwadi (near Shirdi) Sugar Mill doctor Shri M, R. Tagare was proceeding to Kopergaom Post Office in bullock cart to encash his own war bonds of Rs. 2500/- while he was talking busily with a fellow passenger, the bag containing war bonds slipped down from the cart unnoticed by the doctor. As soon as he noticed that the bag had dropped down on the way, leaving the cart helter and shelter a mile or two in search of it, but without success. Uneasiness on account of this loss allowed him no sleep till about midnight when he thought of sitting near Sai Baba's photo he had in his house and praying, he seemed to hear someone telling him "cease worrying*'. This brought him peace of mind and he could then sleep. Nest morning, he had to attend upon an ill friend at a nearby village, so he went there, examined his friend, gave him medicine and casually talking to him about the loss of bag containing the said war bonds. A girl who standing nearby listening sympathetically to the docto'r's talk, ran at once and returned with a" bag saying that it was found lying on the road the previous day. Looking up the bag, the doctor found that the papers had all been disturbed and turned up and down, the finder find nothing from the bag and that the war bonds were in tact. The doctor was over pleased and heartily thanked Baba for His favour and grace. Surrender Shri Sai Completely !! Stupendous Delectation and Deliverance be there !! A devotee clerk in the customs office, once got into a fix when some custom bills once seen and checked by the customs office were recalled and could not be found in the office in spite of all round search he made for these. The Clerk therefore, feared not only for his superiors reprimands but also dismisal from service and prosecution as well. A day passed away and though the bill bundle could not be found. Somehow or other, his superiors clean forget this matter and made no inquiry naturally the clerk was worried much and so he prayed to Baba to save him. The next morning when he went to the office, he found the required bundle of bill on his table. The 'clerk was very much surprised for he was always the first to attend office and the last to leave office. Who could have kept it after the office was closed ? but Baba, he rightly thought. He therefore thanked Baba from the bottom of his heart for saving Him. Surrender Shri Sfti Completely !! Stupendous Delectations and Deliverance be there !! Once a grandson of Baba's devotee Shri Hari Bhau Keshav Karnik by name Keshav was returning from a festival of the Godess Mahalaxmi. He had to stay in the river side of a village which is about 10 miles from his place. He went to the river for bathing and swam in the river. During swimming he lost his 1£ tolas gold ring in the river. He went home with a sad heart. After six months, a Takore came to his house and told them whether any child has lost his ring in the river and he handedover the ring to them after ascertaining its ownership. It is not the Leela of Baba ? Surrender Shri Sat Completely ! Stupendous Delectations and Deliverance be there I ! Shri Jahangir Framji Daruwala served as a Captain. During the Russo-Japansese war, when his steamers except three sunk by the enemy and that the rest of the steamers including his own would soon meet the same fate. He took out Baba's photo from his pocket and with tears in his eyes prayed to Baba to save him and his three ships. Baba atonce appeared on the scene and towd all the sinking steamers to the bank. Just at the time Daruwala offered up his prayers, Baba balled OutHq. and then seated as He was in his usual place in the Dwarakamayee. He had his Kafni and head cloth completely drenched dripping with water more than half an hour, with the result that the Dwarakamayee transformed into a pool of water. The devotees in Dwarakamayee simply removed water from the Dwarakamayae and dried Baba's clothes. On the third day after this incidence, Baba received a telegram from Jahangir narrating how Baba had saved him and offering Him a thousand thanks for His marvelous leela and rescue of himself and the three steamers with passengers. Immediately on his return to India, he came and paid his respects to Baba He had retired now from his service. But in appreciation of his services, the Government had provided him with job. He has taken keen interest in Baba's affairs. Lately he donated about two thousand and two hundred rupees in two instalments and got the Mantap of Dwarakamayee repaired to his satisfaction. Su-render Shri Sai Completely \ Stupendous Delectations and Deliverance be there !! Shri Babu Rao Aurangabadkar when he was in Shirdi, he often compelled Baba for permission to return to his home. Baba told him to wait. As he went on compelling Baba every now and then for permission, Baba was vexed with him and told him "Do whatever you like and I will not bear anything". Without knowing the significance of Baba's words, he started his journey. After he had gone a mile, there came heavy rains and blocked his further journey. He had to stay there in the middle and proceeded his further journey on the next day. Then he realised Baba's advice. Shri Madhavarao Deshpande (Shama) has to go to Kopargaom to attend a call by the office of the Mamlat-dar. Baba asked him not to go. Even then, he has proceeded to Kopargoam to Mallatdar's office. After passing Neemgaom the Mamlatdar himself came to Shirdi, from Kopargaom. Madhavarao met the Mamlatdar and accompanied back to Shirdi. He felt very much for not adhearing Baba's advice. fully recovered and came to Shirdi back and felt ever grateful to Baba. Shri Vasantrao Narayan, Bombay came to Shirdi for Baba's darshan often and often. He has given a Baba's photo to Jahangir Patel, a Parsi Criticisor of Baba. This Jahangir has got a subordinate co-worker Shri Limaye in his office who was also a Baba's devotee. He used to criticisise his co-workers with this Photo of Baba. Limaye asked Shri Vasantrao as to why he has given Baba's photo to this Jahangir, Shri Vasantrao told Limaye that he has given Baba's photo with the aim that Baba would surely set him in the righteous path,. Accordingly after somcdays Jahangir became weeping to Vasant Rao and handedover some dakshina to him to hand it over to Baba. Then Shri Vasant Rao brought Him to Shri Kaka Seheb Dixit and handed over the dakshina amount. On the Guru Poornima day of 1918, all these went to Shirdi and got Baba's Darshan. Thus a criticisor of Baba became stanch devotee •v. of Baba. Surrender Shri Sai Completely ! Stupendous "* Delectation and Deliverance be there ! ! Shri Balasaheb Bhate and Shri Nanasaheb Chandor-kar were college friends. Shri Balasaheb Bhate was a sceptic. He first came to Shirdi in 1894. He was a Mamlatdar at SAKORI. A sant by name Bhau Maharaj came to Bhate. The Sant made Keerthan about KABiR and KAMAL. Bhate heard this attentively and patiently with keen interest. Afterwards he came to Shirdi and Baba has made him to stay in Shirdi for six months on leave and has not gone to duty even after six months. His Superior (Personal Assistant to the Revenue Commissioner) came to Shirdi and asked Bhate to rejoin duty. Bhate told him "that he puft down his per once and it has put down for ever. From that time, he left his post of Mamlardar. Kakasaheb Dixit, Nanasaheb Chandorkar and Madhava Rao Dehs-pande (Shama) requested Baba as they were very anxiety about his family after giving up his job. Baba told him to write an application. Bhate filled an application as he served for 13 years. By the grace of Baba, he got a pension of Rs. 29/- per month without trouble. This shows that a sceptic turned as a Ascetic and a staunch devotee of Baba. Surrender Shrl Sai Completely \ Stupendous Delectations and Deliverance be there ! ! Shri Tatya Saheb Noolkar when he was Sub-Judge atPandharpur, he had pain in his eye and gone to his brother who is a doctor at Jalgaom for treatment. After having known that Gurupournima has to take place within 2 or 3 days he started immediately without any treatment to his eye and came to Shirdi. He lay down in his lodging with pain in his eyes, When he came to Baba for darshan Baba told Shama in His own Charac-teresdc way "Shama, My eyes are giving trouble and that I am suffering much from pain". From that time wheu Baba uttered these words, the pain in the eyes of Shri Noolkar has disappreaed. Then Shri Noolkar remained in Shirdi, till his death. During the time of his death Baba gave Udi and Thirtham to drink and gave satgati to him thereby. Surrender Shri Sai Completely ! Stupendous Delectations and Deliverance be there !! Mrs. Malanbai daughter of Shri D. R. Joshi Dev-gaonkar has suffered from T. B. After all medicines having failed, she insisted on her being taken to Shirdi. When brought to Shirdi, Baba asked her to He down on a blanket and take nothing, but water. She carefully followed these instructions but after a week or so, she died one early morning. Baba was then in the Chawadi and for the first time in Shirdi History Baba did not leave Chawadi though it was past 8 A.M. The daughter's parents, with heavy hearts were pareparing for the funeral when Malanbai appeared to breathe, opened her eyes and looked round about as if much frightened. Then she said "A black person had been carrying me away, very much frightened, I cried out to Baba for help. Baba took His Satka and gave him good cudgling snached meaway nd and carried me to Chawadi." She gave a correct description of Chawadi. Just at this time, "Baba left His Chawadi bed bawling out striking his Satka against the ground and came shouting to Dixit wada where the girl had put up; seeing Malanbai restored to life, there was joy alround. Is it not the greatest of all the supernatural powers of Baba (Giving life to the dead) ? Surrender Shri Sai Completely ! Stupendous Delectations and Deliverance be there ! ! Shri Janardhan Moreshwar Fanse alias Haribhau Fanse wearied with carrying on the burden of his wordly cases informing his mother left his home for Rameswaram. However Shirdi is on the way and with a view to have blessings from the far famed Shri Sai Baba, he came to Shirdi. He felt so much attracted by Baba, that he stayed at ghirdi for one week. When he asked Baba's permission to go to Rameswaram, Baba ordered him to go home. Saying his mother had left food since the day he had left home, she might die. He gone home. The mother was very much pleased to see her son back at home and was convinced that Baba was omniscent. In the meanwhile a person of his village being attached with cholera approached him, he administered to him Baba's holy ashes and he was cured. This led to people to think that he was a pysician. The holy ashes however soon exhausted and so Haribhau was embrasced as to how he should deal with another cholera case if he got one. But luckily for him the cholera left his village and casually met one Marwari merchant known to him. The merchant seeing that a simple devotee had come to meet him told Haribhau "Look here, my brother is seriously ill, all physicians and doctors have tried their utmost to cure him, but they have all failed now since you are Shri Sai Baba's devotee, if your Sai Baba is really a saint, he must cure my brother through you. Haribhau saw the patient found the case to be serious, was therefore anxious to slip away but as it was night, he could not leave for home. At night when Haribhau bha-jan (prayer) time became due, the patient himself made the necessary preparations for bhajan and through out the Bhajan sat concentrating on Baba's Photo. This surprised all and the Marwari now said "whether the patient dies or survives I will have his medicines from none but you." To avoid the responsibility, Haribhau purposely quoted his fees in excess of those of the Civil Surgeon at Rs. 200/- The marwari agreed to that. That night Baba appeared in Shri Haribhau's dream and told what the disease was and the medicine to be prescribed for it. Haribhau prescribed the said medicine and the patient started taking this medicine. The patient fully recovered after a time and so the marwari offered Rs. 200/-, the stipulated fees for Shri Haribhau, but Haribhau would not accept it stating that he had done nothing it was his Guru's Work. Marwari could not rest satisfied till he made good Haribhau's labour in some form or other. So he bought a scarf worth Rs. ?00/- and going to Haribhau's hours, when he was out and left it there. Haribhau could not refuse the acceptance, but he felt that the price amount of the scarf should be sent to Baba. However he was pennyless and Baba had also left off His body in the meanwhile, offering his night prayers, tears rolled down his eyes. That very night Baba appeared in his dream and said "There is famine allround at present, so sell the scarf and purchase rice from this amount of Rs. 200/- and sell it under price for the present. Carry on this busine till the amount of Rs. 200/- runs out. Then sell lice at profit and you will be able to made a living." Following these instructions, Haribhau prospered and became 'nappy and then never thought of deserting home. Shri Moreshwar Pradhan and his wife Chottubai loved Baba from the bottom of their hearts and carefully followed every word of Baba, Baba in His turn took care to look after their welfare. Once all their children have Chicken pox, all of them except the youngest got over that illness, but the youngest who was the weakest of all did not cure and one day his illness took a serious turn. Doctors gave up all hopes of child's recovery. All the symptoms of collapse appeared on the child's face, parents sorrowfully waited upon the child chanting Baba's name. When Chottubai suddenly fell asleep and in the dream she saw Baba appearing before her and said what is all this ? the child is alright safe and sound. He would ask something to eat at 6-30 AM. Give that to him without fear." Chottubai woke up and was surprised 10 see that the child showing symtoms of good health, the child was fast asleep his fever had left him and the persons, in attendance were all in a very good mood. Correctly at 6-30 A.M. the boy asked for his meals as Baba predicted and the mother atonct; gave him all he wanted. A few days after, he fully recovered. A boy of Sawantvvadi named Ganesh Gopal Maha-jan was very weak and so from time to time he suffered from some illness or other. His devoted mother therefore, very much wished that if the boy go to Shirdi and pay respect to Baba, his health might improve. The boy was alse very anxious to go to Shirdi but he was a mere Clerk of Rs. 15/- per mensum at Khatav Mahajan Mills, The mill Manager R.A.Tarkhad was a Baba's Devotee. As a water pump at Shirdi required repair very badly he arranged to send an Engineer to Shirdi. The Engineer determined to utilise this opportunity by taking his family with him. Mrs. Tarkhad also seeing that the Engineer was proceeding to Shirdi with his family joined them, coming to know of this, the boy Ganesh went to the Victoria Terminus with some flowers and with some fruits to be sent to Baba with the party going. Mr. Tarkhad was there A few minutes before the train was to start, Mr. Tarkhad asked Ganesh that if he would go to Shiidi, he may. On hearing the boy's reply in affirmative, he handedover to him a rail way ticket saying that one member of the party had not turned up and so the ticket was a surplus. The boy sent word to his mother about his going with some Thana passengers and proceeded to Shirdi, thanking Baba for the arrangement that-he had made for going to Shirdi and paying his respects to Him and there on he was alright. Shri Krishnaji Narayan alias Chottu Bhaiya Saheb Parulkar was suffering from vomitting as and when he took meals. He has consulted all the doctors, but in vain Shri S. R. Pattavardhan, a friend of his father has sent a well known doctor from Nagpur for his proper treatment. The doctor gave him three small packets of medicines for taking them one in the morning, one in the noon and one in the night. After taking it as prescribed by the doctor, he gone to motion for several times that he was not even able to walk by 8 P.M. and became so weak that all were afraid of him. Then the doctor went to his Puja room and prayed the Almighty and gave medicine to stop the motions. After taking this medicines his motions and vomittings have stopped from 11 A.M. The doctor told his father that no medicine will cure his vomittings except that of the grace of Blessed soul. After 5 or 6 years of this incidence, Mr. Parulkar had the chance to come to Shirdi and took darshan of Baba. Neither himself nor anybody have spoken to Baba about his affair. During his next trip to Shirdi i.e. on a Guru Pournima day, he again met Baba with his brother and a third person was sitting before Baba by about 4 P.M. At that time one mousibai came there. Baba asked her "why you come late" ? Mousi Bai replied "Baba, you made me to vomit much and often and hence I came late". Baba told her "That because you eat much, you have to vomit muoh". For this Mousi Bai told "Baba I have vexed with my often vomittirtg and by this I even vexed with my life". Baba to'd her pointing to Parulkar that this man also vomittirg for many years. On hearing this Parulkar's brother requested Baba to stop the vomittings of his brother. Baba told him that his brother did not vommit hereafter and from that time Baba uttered these words, his vomittings have stopped and he ever felt thankful to Baba. Surrender Shri Sai Completely ! Stupendous Delectation and Deliverance be there ! ! Shri Bapusaheb Buty was once suffering from severe fever (i.e.) 105° in 1915 for one month. He was not in a position even to walk. Even in this stage, Baba called him to come to him on some body's back to the Masjid and given to him (Seera) a variety of sweet, Payasam, Bajji and dal oosal and made him to eat all these in His presence and returned him back to his lodging. Without any medicine, the fever abated. During this time, Baba was also fell ill. But as soon as Buty recovered, Baba was also recovered. This shows how Baba also suffered along with His devotees in order to relieve them from their sufferings. Shri Kakasaheb Dixit, on one occasion had suffered from pain in his left leg and he was not able to walk even for a short distance of one furlong. Baba started to go to Neemgaom. Dixist also accompanied Baba and returned back to Shirdi after walking a distance of four rciles to and fro with his pain leg. During his walking, he has not felt any pain in his leg. Is this not due to Baba's grace ?. In 1917, a Maha Mandal in respect of "Bharadwaja Gotra was being conducted in Babol village in Vengutla Taluk of Ratnagiri District as was being done annually. They invited Annasaheb Dabholkar to be its President. He consulted Baba. But Baba refused permission. Hence he dropped the matter. The same thing happened in tne next year also. Then Baba appeared in his dream and ordered to take the Presidentship of the Maha Mandal. Afterwards he became the President of it. Dabholkar's daughter became sane and she adheared only the words of her father and none other else and she would not be in her house without her father even a moment, Dabholkar with Baba's permission went to Dahhol and returned back to his house at Bandra in Bombay within four days. During his absence, she was alright. When he returned back she suffered much. When some sorts of fits came, she would be in nobody's control and had to lock her up in a room. Apart fiom all these she was a pregnant woman. Three famous doctors have examined her. After thorough examination they have told that if the child had to be born safely, an operation is necessary by which the status of the mother would be a doubtful one. On the next day, another doctor came and advised to seek the Divine aid. He prayed to Shri Sai Baba for her safe delivery. She delivered a child without the help of anybody. After sometime she and her child came to Shirdi and took Baba's darshan. Baba placed his hand on her head saying that all would go well and from that time, all her sufferings have come to an end and never came afterwards. Shri Raghuvir Bhaskar Purandare is a devotee of Shri Sai Baba. Once his wife suffered from continuous vomittings and passing of stools from 3 A-M. and was in such a position till 8 A.M. Her body became cold. The doctor has tested her body and told that she will die within one hour. Without knowing her status, Purandare was in the house of a goldsmith from the morning itself who wanted to prepare a jewel for his niece. He was called on to his house. All were mourning about her. On his way home, at Datta Mandii- Baba appeared in the form of a Fakir with a Joli in his hand and totd Purandare "Don't fear for your wife. She will not die. Give her udi mixed with water. She will recover in half an hour. I am safeguarding you all". Accordingly, udi was administered in her mouth with water. All the members waiting on her told that he should not pour water in the closed mouth. Kot adhering to then, he poured the Udi water by opening the teeth with the help of a spoon and the remaining Udi he applied it all throughout her ! ocly. After having done this, he took bath performed pooja with naivedya and took his meals without waiting for anybody. The doctor came again and examined her. He told that the body had got the temparature and the pulses were in normal and asked Pursiidare Wbac you have given Her ? Purandare replied that he had given nothing but Baba's Udi. Then the doctor has also given medcine and she became completely alright afterwards by the grace of Shri Baba. 27.BABA CURED THE HEAD ACHE OF SHRi RAGHUVIR BHASKAR PURANDARE:. Shri Raghuvir Bhaslar Purandare has built a house as per Baba's orders at Bandra (Bombay). He then suffered severely from headache that he was not in a position to bear it. Hence, he wrote a letter to Baba that instead of giving such pains, it is better to please finish his chapter once for all and handedover it to Shri Dr. Filial who was going to Shirdi, with a request to give it to Baba. He did likewise Baba then gave Udi and a small packet of snuff like subtance with instructions to Purandare to take it through his nose. Purandare did like that and the headache abated with no trace of it. After somedays he wrote a letter to Baba to inform him when he should perform Grahapra-vesam in the new house. Baba replied "that you may perform Grahapravesam in the new house on Thursday aiid I too will come along with you." Accordingly on Thursday he proceeded to the new house with Baba's photo in his hand. On the way, he met Baba in Datta Mandir and He also accompanied him to the new house tili Purandare kept Baba's photo in the new house and then disappeared. This shows that Baba is ever ready to fu!6I the desire of His devotees. Surrender Shri Sai Completely ! Stupendous Delectation ahd Deliverance be there !! Shri Ramakrishna G. Kothare was bron in 1908. His caste was Pathare Prabhu. His father and mother firet came to Shirdi in 1911 and they were worshipping the oil paint Photo of Baba (Dwarakamayee Posture). They used to go to Shirdi at least twice a year. bhajan Mandal came on foot upto Kopergaom. From Kopargaom all came in 5 carts to Shirdi whereas patient's wife alone followed the cart on foot up to SHIRDI as per her vow. She came to some distance in an uneven stonny and thorny way and felt uneasy with swollen legs and sat below a tree. A man with white beared in shepherd dress straight away came to her and told her that her vow had been accepted by Baba and that there was no harm in getting into the cart and go over to Shirdi. But she did not accept and came away by foot along upto Shirdi. At that time Baba asked Jog to stop the Arati for a little time. In the meanwhile all came to Arati. Baba told to Nanasaheb that I met her on the way and told her to come in cart. But she refused and came by foot. See how her legs, were! They will be alright by the evening. They all stayed at Shirdi and gone to their homes with Baba's permission safe and sound. Shri laxman Abaji Avare, Thajanpur Chthedi near Sinner, Nasik district was suffering from eye pain and water began to ooze from the eyes for about six months. His Eye sight has gone even though medicines were tried. Some one had advised him to go to Shirdi for permanent cure. He came to Shirdi with his mother for Baba's darshan on a Thursday. At that time slabs have been fixed in the "Sabha Mantap" of Dwara-kamayee. Son and mother took Baba's darshan. Baba gave them udi and blessed them by saying "Allah Acha Karega" They have gone to their home. Afterwards the pain and the water in the eyes have been ceased. From that time onwards they used to come to Shirdi on every Thursday for Baba's darshan. Likewise they came to Shirdi for six months. The villagers have insisted his mother and sent him to J. J, Hospital, Bombay for treatment. At the time when they prepared to go to Bombay his body became more or like with burning sensation. Without minding that they have gone to Bombay. There an English expert doctor examined his eyes and told that the eyes have been spoiled and that the eye sight was however not possible. They returned to the village and determined whether eyesight comes or not, they have to stay with Baba. Thus they stayed at Shirdi for sometime. His mother after some days left him alone in SHIRDI and gone to the village. He stayed in Shirdi with firm belief in Baba. He used to wash his eyes with the face washing water of Baba in the morning. After doing this for one month, all on a sudden, his eye sight came. When he took Baba's darshan in Chawadi one evening, Baba gently clapped His hands on his chest. From that time his eye became very much clear. He was in Shirdi till Baba's Mahasamadhi. Then Radhakrishnamai requested him to pump the well water, now in Saranjame Baug and also he will do all the work ordered by her. His firm faith and patience towards Baba gave him permanent relief from his blindness. Shri Govind Rao Gadre of Nagpur felt much when his nephew came to his house and suffered from disease. He prayed to Baba, that if his nephew got well, he would send him to Baba for His darshan. Accordingly, his nephew got well in two days by Baba's grace and went to his house. But he was not sent to Shirdi for Baba's darshan as per the vow of Shri Govind Rao. Once again the nephew came to his uncle's house. At that time Govind Rao himself suffered from the disease. On one Thursday, all the family members prayed Baba with Bhajan. Govind Rao joined in the worship. Then he remembered that his vow has not yet been fulfilled by his nephew. Hence, he made another vow that if he would become alright, himself and his nephew would go to Shirdi for Baba's darshan. Then he was relieved off his sufferings. They both went to Shirdi and took Baba's darshan. Surrender Shri Sal Completely ! Stupendous Delectation and Deliverance be there ! ! In May, 1916, a lady devotee from Bombay came to Baba for darshan. At that time Baba and two other women Smt. Janabai and Smt. Laxmibai were grinding wheat flower in the grinding stone. She asked Baba that she would grind the wheat. Baba told her that she would feel fatigue in grinding the wheat. She replied that she would grind as much as she possible to grind. Baba asked Laxmibai to leave the grinding stone to her. She began to grind the wheat. She questioned Baba why the wheat was grinding ? Baba replied that He would save the devotees at times. She also questioned why Baba was going to the stream side and throwing the wheat flour ? Baba told that at times "Akkabai" (Maari Ayi, Maariamma, Cholera and small pox etc.) wanted to enter the village and I prevented them on the other side of the stream and not allow them in the village. That is why I have to feed them and that I throw the flour to them. She again asked Baba whether there is "Jari" "Mari" (Durdevatha). Baba replied there exists "Durdevatha but they won't do anything harm to us". For that she told Baba that some were dying on account of Durdevatha for which Baba told that Durdevatha was scolding me to allow her to enter the village. At that time, I request the Almighty and gave her the allotted persons to her. Again she asked Baba, "whether there are evil sprits" Baba told that there are evil spirits and that they won't do any harm to us". She told when she was in Naigaom in Bombay a figure of an evil spirit used to come from the well side ' and go to the room in the upstair and disappear. Baba told her that he knows him and he was the house owner of her house and he became an evil spirit and further told her that he used to disappear only in the room where she delivered". She told Baba as to how he knew all these facts"? Baba replied that He knows her from her childhood and further told her you have forgotton me. I will call off my children even if they were one thousand miles away. My care will always be alike towards all. All men good, bad rowdis are coming to Me I have to look all of them. During these conversation, she felt tired in grinding the wheat flour and asked Laxmibai to continue grinding work. All the three finished the grinding work and the Bombay lady knew well about evil spirits. Surrender Shri Sai Completely / Stupendous Delectation and Delivervance be there !! A Cashier of a well known Bombay Firm had made away with a large sum and came to SHIRDI to save himself from arrest etc. A warrant was obtained and the work of executing the warrant was entrusted to the firm Manager, a Baba's devotee. The Manager tried his utmost to trace out the culprit cashier, but he could not find him. He was at a loss to understand whether he should continue the search or return to Bombay. So he came to Shirdi to have Baba's darshan in this matter. To his suprise he found there, the culprit cashier seated shampooing Baba's feet. On seeing the Manager, the Cashier got nervous, prostrated before Baba, and enrnestly prayed to him for saving him. Baba advised him to accompany the Manager to Bombay to confess his crime to his masster and to request him to pardon him. The Cashier Carried out Baba's instructions in toto and was saved from criminal prosecution and the Manager also received his master's thanks for dexterourly handling this affair. Shri Chidambar Rao Keshav Gadgil was acting as Personal Assistant to the Collector of Ahmednagar District and then as Mamlatdar, Sinner. During these periods he used to visit Shirdi often and often to have Baba's darshan. He was transferred to a distant place with an order to join in the new post forthwith. From Sinner he has to go to his new place (via) Kopergaom railway station. He thought and felt very much for his inability for not attending Shirdi eventhough he was passing through Kopergaom. No sooner he thought likewise a packet containing Udi was thrown to him from the window of the train. He has taken that packet and found that it contained Baba's Udi. Sometime after this incident he came to Shirdi for Baba's darshan. 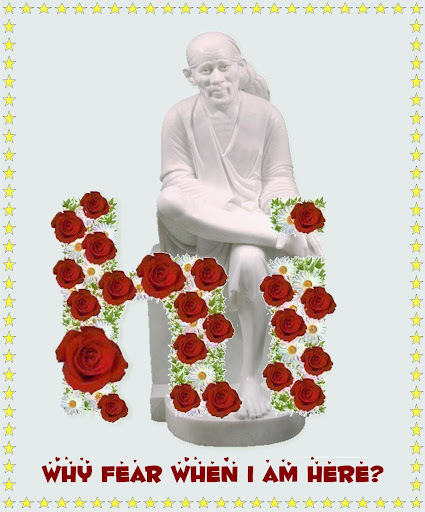 Then Baba told him that eventhough he was not able to come to Shirdi, He has sent His Udi, After hearing this, Gadgil's heart filied with joy and he placed His Udi in a talisman and wore on him for ever. This clearly shows that Baba is ever ready to fulfil the hearty desire of His devotees. Surrender Shri Sai Completely ! Stupendous Delectation and Deliverance be there!! Two friend devotees from Bombay suburbs went to Shirdi to pay their respects to Baba and stayed at Shirdi for two days. At the time of leaving Shirdi they purchased two copies of Baba's photo and started their journey. Thereafter on the way one of them remembered his brother and felt sorry that he has omitted to purchase one more copy of Baba's photo for him. On reaching home, when he untied the packing of photos, to his surprise, three copies of photo were there instead of the two they had purchased. Ardent devotees as they were, Baba by his superhuman powers had requited their love and given one more copy of His photo for his brother. This shows that Baba is ever ready to fulfil the wishes of the wholehearted devotees. Shri Kakasaheb Dixit had purchased some lands from Shri Laxman Bhat of Shirdi in 1910 for which Bhat demanded Rs. 200/- But Dixit was williug to pay Rs. I50/-. A discussion was going on in the matter. Baba on seeing Laxman Bhat passing before the Masjid called on him and enquired "what was the matter between you and Dixit ?". Bhat told all the matters for which Baba told him "that you may sell the lands at Rs. 175!-". Dixit gave Rs. 150/- to Laxman Bhat as prr his own decision when Bhat gone with the amount to his house and counted it, to his surprise there was Rs. 175/- as settled by Baba. Was is not the Leela of Baba to fulfil the desire of Shri Kakasaheb Dixit? Shri Shankar Rao a devotee of Baba, when he came to Shirdi for Baba's darshan, Baba asked him dakshina frequently and emptied his purse. As he had to return to his home on the next day, he has got full faith in Baba that somehow or other, Baba would manage him to return his home and hence, he least worried about his returning home. His friend, who was a guest to the Post Master of Rahata came to Shirdi and met him unexpectedly and repaid to him a long standing loan of Rs. 20/- which was taken from him by his friend some years previously and this made his return journey with ease. Please see how Baba played His Leela in the repayment of a longstanding loan and thereby creating faith in Him. Surrender Shri Sal Completely / Stupendous Delectation and Deliverance be there !! Shri Laxman Rao alias Bhausaheb Pradhan, Sub-Registrar was sent to Baba by Shri Madhavnath Maharaj with a news which was not told to Pradhan. When he came to Shirdi, Baba told Nath's son has arrived and we have to dine to day Nath's Prasadam. Then Baba told Laxman Rao, "I got sacks and sacks of gold on asses back. Thieves have stolen them on the way. A hole in the ear has to be piersed only by a goldsmith. It is very difficult to pull on in this naughty world. You have been sent here only to know his fact. Tell this much to my brother Madhavanath". Then Laxman .Rao satisfied and went away. Surrender Shri Sai Co mpletely I Stupendous Delectation and Deliverance be there !! The grand father of Shri Vittal Rao Yashwant Deshpande pressed his son to send him to Baba for His blessings. So Vittal Rao arranged to send him to Shirdi with his son. Led by the grandson, the grand father went to Dwarakamayee, prostrated himself before Baba and sorrowfully prayed to Baba to return the eyesight. Baba said "you will be able to see". So soon as Baba uttered these words, the grandfather had his eyesight restored to him. He was able to see everything. Blindness left him entirely. Never was anybody's prayer for relief granted so soon by Baba. All wondered at it. A blind devotee went to Baba and prayed to Baba, "I have lost my eyesight. I do not feel its loss for want of eyesight, as it keeps me away from many undesirable things; all the same. I want to see the human form in which my Lord have manifested Yourself. Please therefore grant me eyesight till I satiate my eyes ' by beholding Your human form and You may withdraw this eyesight so soon as that is done". Baba at once granted his request, he saw Baba with his own eyes and then he lost vision and became blind as per his wish. A stark blind devotee singing with the tune of his symbols before Baba, with the one formula "Rama Krishna Hare" (names of incaranations Ram, Krishna and Vishnu) in the year 1913-15. His Holiness Shri Sai Sharananand who has given foreword to this book saw the same man in Shirdi in 1942-43 reciting chapters of Srimath Bhagwad Geeta about Lord Krishna and also poems and verses from well known Maharashtra Saint Gnaneshwari's Amratanubhava, asked him "when did you get your eyes?" He said, "through Baba's grace, he had blessed vision during His time and thereafter I got a clear vision. Through Baba's grace I was able to read, write and move about freely", To assure the questioned person he read out several versus from the said Amratanubhava that he had with him. A farmer was very anxious to obtain from Government a loan of Rs. 500;- for a well in his farm and he applied twice to the Government but his applications were rejected. The farmer approached Baba in the matter and Baba spoke to Nanasaheb, the then Collector's Chitnis about it. Nana said he would certainly present his application as required by Baba, though he had no hope of the application being granted. The farmer therefore, applied again and Nanasaheb presented the application to the Collector informing him at the same time that two similar applications of his were rejected previously. The Collector thereupon asked the farmer why do you press the Government for a loan? The farmer himself put clearly his case before the Collector and said Sir, I owe Rs. 500/- to Government I am anxious to repay the loan. I cannot do this until I have a well to water my lands to get better crops. I have started digging the well, but the work had to be stopped owing to the intervening of big rocks, unless they are fired by dynamite and removed, the well work cannot be completed and I cannot get water. Without water I cannot have enough crops to return the Government loan and so I press the Government through this third application. The Collector had satisfied with his explanation by Baba's grace and granted the loan to the farmer. Shri Ramachaadra Maharaj was required by his Master, Shri Gadge Maharaj to defrey a day's expense of the Yagna a sacrifice, which his guru was performing. So Ramachandra Maharaj went to Belapur and round about places performing Kirthans and obtained promises of the sum required. More than the sum required had been promised, so he thought that he had nothing to worry about. He once again went to Belapur a few days before the performance to receive the promised amount to be sent to his Guru Gadge Maharaj. But as usually happens, the Belapur people evaded payment of the promised amounts. Ramachandra Maharaj thought that he could not understand as to how to make up the required amount. He therefore, offered an earnest prayer to Baba to help him to keep up his promise to His Guru. Baba is ever ready to fulfill the just prayer of His devotees, inspired one devotee to pay the whole amount of Rs. 100/- to Shri Ramachandra Maharaj during his Kirthan in the next day morning. Need it be said that this strengthened Shri Ramachandra Maharaj's attachments to the ever merciful Baba. Sri Nanasaheb Chandorkar got into a fix in certain family matters. His father Govind Rao Chandorkar was also a Deputy Collector like his son and stayed in a house built by himself at Kalyan. Lately some unpleasantness had grown between him and the local musalmans and so he had ordered all the members of his family to desist from having any connection whatsoever with musalmans in general. When Nanasaheb happended to return home, he was informed of what had happened and his father's standing order about having no musalman connections. Nana was puzzled. He was prepared to give up all connections with Musalmans, but he was not prepared to disassociate himself from Baba. If his father took Baba to be a Musalman naturally he would expect Nana to give up Sai Baba. This embrassed Nana So he spoke to his father about his connection with Sai Baba. In the meanwhile Baba had already given proper turn to his father's mind in the matter. So at once he said to Nana "My Guru is Sakkaram Maharaj" but your Guru is not Sakkaram Maharaj. So even if Shri Sai Baba may really be a Mohamadan He is your Guru and you may most willingly continue to Him without the least objection from me". On hearing this Nana saheb was overjoyed and heartily thanked Baba for the happy solution of the puzzle he had to face. Surrender Shri Sai Completely !!. Stupendous Delectation and Deliverance be there !! Shri R.B. Furandare, a railway servant applied for leave as he wanted to go to Shirdi with his family. The leave was sanctioned and railway passes for free railway journey were also given to him. A day previous to his departure, the railway workmen were reported to be planning a strike. So his superior officer requested him to cancel his programme. Purandare was adament and he said that he would never change his programme for Shirdi he had fixed already eventhough the officer promised him, he would see that he gets his leave and also the railway passes after the crises had been tied over. Purandare returned home and made all preparations for starting. That very night Baba appeared in his dream with a Satka in His hand. He was mighty, angry, strongly admonished him and finally ordered him "Don't come to Shirdi over again". So Purandare dropped the idea of going to Shirdi and attended the officer on the next day as usual. This pleased his Superior, the little doubt that he had about Purandare's complicity in the railwayman's strike at once vanished. So a month after he granted him his leave and reprocured railway passes for him. When he went to Shirdi, Baba said "Don't go mad, we have as yet many responsibilities to discharge, so stay at home chanting my name". This clearly shows Baba's disapproval of His devotees running over to Holy Saints throwing aside duties and responsibilities. In 1914 June, before going to seven days retirement, His Holiness Shri Sai Sharan Anand had kept before leaving for Bombay an empty compass box with some coins in it for Baba's use at Radhakrishna Mai's house beneath her cup board without informing her of it. Soon after he reached Bombay he learnt that Baba had made Radhakrishna Mai to look up her room carefully to find the said box and deliver the said seem to him Radhakrishna Mai on taking the search of the room did find to her amazement the said box with coins, she immediately sent the same to Baba and this appeased His Holiness Shri Sai Sharan Anand. Mr. Joshi son-in-law of Bahadur Thana was an angry devotee of Baba and was not able to go to Shirdi and pay his respect to Baba as all the members of his family and all the friends have been luckily enough to go to Shirdi and pay their respect to Baba. He therefore became angry with Baba and declared that if Baba was really a Saint, he would give darshan to him even without going to Shirdi. Nothing was beyond Baba's ken. It seems that he accepted this challenge and satisfied him. When some gentle men from Konkan gone to Shirdi with their wife and children and were returning home, Baba asked one of them, if he would do a piece of work for Him. When he said that he would do it most willingly, Baba gave him a little packet of Udi and said "You go by mail and give this holy ash (Udi) packet to him who requests you to give a span full of space for his accommodation in the train". The gentleman assured Baba he would discharge His trust without fail but that if he did not meet no such gentleman, he would immediately write to him. Baba gave him Udi packet. The gentleman started by mail, no such gentleman as described by Baba turned up till the train left Kalyan. The gentleman thought that the train did not stop at Thana and so taking out a post card he was preparing to write to Baba, when to his surprise, the train stopped at Thana and just after the while for the train to start a gentleman running drenched with prespiration has gone in. He approached this Konkani gentleman and said to him "Please take up this child of yours and give me a span full space to sit as I am feeling giddy". The surprised gentlemen at once made room for him and handed over to him the packet of Udi saying that it had been given by Baba for being handed over to a person who called me for a spanfull space in the train. As you fully answered to that description with great pleasure, I give this Baba's little Udi packet of holy ashes to you. Mr. Joshi respectfully received in his own hands wondered at Baba's wonderful knowledge and the grace of Baba had conferred on him, angry child. Surrender Shri Sat Completely !! Stupendous Delectation and Deliverance be there !! Shri Kakasaheb Dixit was once suffering from fever at the time of his going to his office in the train. He prayed to Baba that if his fever increased he may be called to Shirdi. He suffered from fever through out the day and also during the way to Shirdi. After reaching Shirdi, his fever left him. From that time of his arrival in Shirdi, Baba also suffered from fever. This clearly shows that Baba Himself used to relieve the sufferings of His devotees by suffering Himself. A lady name (not mentioned) of Poona who was issue less wanted to go to Shirdi and have darshan of Shri Sai Baba. She was in know of the fact that if she got a coconut from Baba, she would be blessed with a child. But however, she tried to go to Shirdi, the journey was however a stand still by some reason or other. By this she felt very much dejected and thought whether there was any good future to her ? One day night, Baba appeared in her dream and given a coconut to her as Prasad for which she was eagerly waiting for a long time. After she woke up from bed in the morning, she actually found a coconut in her bed. She wonder struck and made a vow that if she got a child by this Prasad, she would go to Shirdi with the child for Baba's darshan. Accordingly she got a male child in the next year and went to Shirdi with the child and fulfilled her vow. Is it not wonderful that a coconut given by Baba in a dream gave child to a Childless lady !